We had two visits last week, one friendly and one not so friendly. The very friendly visitor was from Ames Medical, our newest sales and marketing group in Taiwan. 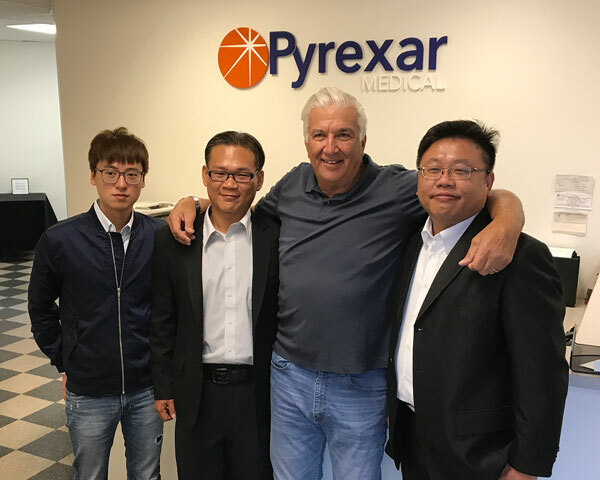 Steven, Johnson, and Andy spent the week with us for sales and technical training on the Pyrexar product line. They have some excellent ideas on how to penetrate the Taiwan market and have put together a well thought out strategic sales plan. 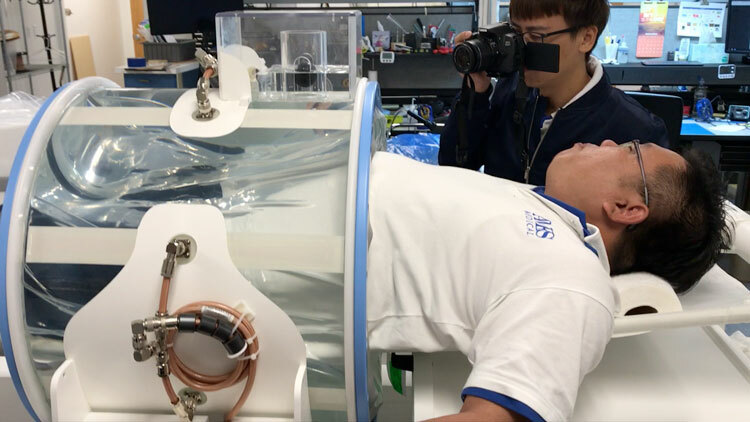 During the visit, Steven wanted to see what it felt like to be a patient in the BSD-2000, so we put him on the patient sling inside both the Sigma 60 and Sigma Ellipse applicator and filled the bolus with water. (we left the power off). He remarked that being surrounded by the bolus was both comfortable and comforting. He mentioned cancer patients in Taiwan were afraid to move around while receiving hyperthermia treatment. We hypothesize that may be a belief left over from the importance of not moving during radiotherapy. We assured him that the heat zone on the BSD-2000 was large enough that casual movement would not affect therapeutic outcomes. On Friday, as we were about to send our visitors home, a water main under the building a few doors down broke. What started as a puddle, turned into a torrent and headed to our building. It was all hands on deck, including the Ames Team. We all grabbed brooms and created makeshift water dams and attempted to push the water out as fast as it came in. We managed to quickly get everything off the floor. After 2 hours, the fire department turned off the water and we started to put everything back together. We appreciate the help from our new sales partners, along with the enthusiasm they bring to hyperthermia and the treatment of cancer.